Cris Carter, Randall Cunningham & Warren Moon Autographed Minnesota Vikings Pro Line Helmet by Riddell | Sports Memorabilia! 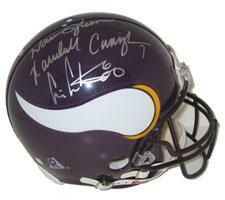 This is a great item signed by Cris Carter, Randall Cunningham and Warren Moon. The autographs are in silver on the Vikings style of helmet applicable to these three great Minnesota Vikings. Cris Carter was inducted to the Pro Football Hall of Fame Class of 2013. NSD witnesses all autograph signings. A NSD numbered hologram and NSD certificate of authenticity is included. Autograph location for each player may be different than pictured. Cris Carter is a 2013 Pro Football Hall of Fame inductee who played in 8 straight Pro Bowls and named one of the 50 greatest Vikings. He has been an analyst for several networks and currently is an assistant coach at his son's high school.